A bi woman and her mother have both been murdered in Missouri in a suspected hate crime attack. Danielle Smith, 27, and her mother Terri Jackson, 61, were both found murdered in their Camden County home on August 29. The autopsy showed that the pair had been stabbed multiple times prior to their trailer home being burned to the ground. After the vicious stabbing attack on the pair, a fire was set using accelerant, according to the State Fire Marshal. Their 54-year-old neighbour Steven Ray Endsley has been arrested over the attack. Endsley is alleged to have pursued a sustained campaign of homophobic harassment against Smith and her mother, with reports he sent a string of anti-gay texts to and about her. According to local news outlet LakeExpo, court documents show he ranted about “Bipolar Lesbos” in texts prior to the attack, adding: “no dikesor faggots” [sic]. Records show police had responded to multiple disturbances between Endsley and the family before, and he had apparently threatened to burn their home down previously. He is facing two counts of murder, one count of arson, and three other felony charges, while the FBI is investigating a homophobic hate crime charge. Friends told authorities that Ms Smith was bisexual, which sparked the animosity. 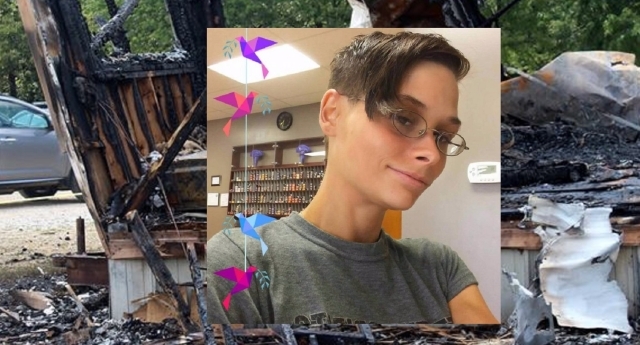 Ms Smith’s sister Heather told local media that she had endured “nine months of him throwing fire crackers at her house or trailer, calling her names, even harassing her friends that would come and visit. She said: “[Police] told her they couldn’t do anything until something physical happened. Unfortunately it escalated into death. A GoFundMe page has been set up by the family for funeral costs. Heather Smith wrote: “We are saddened to have lost two amazing people that loved everyone. “Danielle would always do what she could to help someone else, if she was able, without question. Our hearts are broken by the loss of Danielle and Terri.